The judges for the Start-up Challenge event were (left to right): Brandon Allgood, CTO at Numerate Inc. and a UC Santa Cruz Foundation trustee; Gil Frostig, vice president of engineering at QualComm; and Michael Riepe, principal engineer at Achronix Semiconductor and chair of the Baskin Alumni Advisory Council. 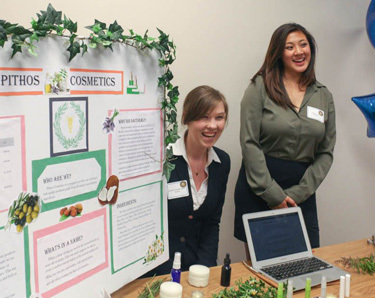 Liz Howard-Gibbon and Maggie Chen presented their business plan for Pithos, a cosmetics company offering high-quality organic products made from natural ingredients. 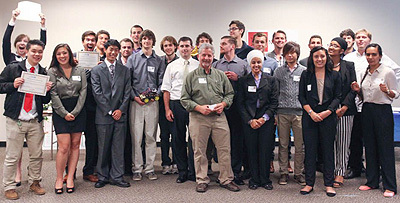 Gideon Shaanan (center front) with the students who participated in the Start-up Concept Challenge of the UCSC Entrepreneurship Studies Initiative. A collaborative productivity website for students and instructors, an automated home hydroponics system, and an online site for making trades are among the start-up business plans developed by students in Gideon Shaanan's entrepreneurship courses at UC Santa Cruz. 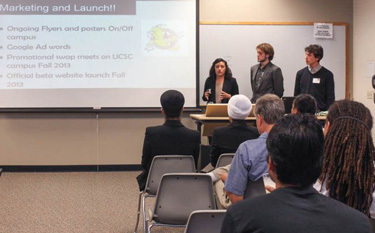 They were featured at an Entrepreneurship Showcase event held June 8 at the UCSC Silicon Valley Center, where business leaders, investors, and venture capitalists mingled with faculty, students, and alumni of the Jack Baskin School of Engineering. "From my point of view it was a resounding success," said Shaanan, lecturer and academic coordinator of the engineering school's Technology and Information Management (TIM) program. "The students did a great job and the feedback was extremely positive. I plan to continue mentoring several of the teams." Atiq Raza, chairman and CEO of CALIENT Technologies and former president and COO of AMD, gave a keynote talk on entrepreneurship, drawing on his distinguished career in Silicon Valley industry. 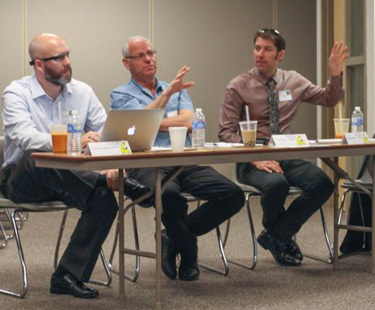 Michael Riepe, who was instrumental in organizing the event as chair of the Baskin Alumni Advisory Council, said it brought together a diverse mix of people and activities related to entrepreneurship and UCSC's engineering programs. "We wanted to show the Silicon Valley start-up ecosystem what UCSC is doing in entrepreneurship and engineering," Riepe said. "In addition to the student presentations, the event showcased the infrastructure we now have in Silicon Valley and the opportunities for collaboration with the Baskin School of Engineering." The day began with a "Start-up Challenge," in which ten student teams presented their business plans to a panel of judges. The judges selected three projects to feature in the Entrepreneurship Showcase event in the afternoon: Aganki, an online academic and social platform; PyDroponics, a self-controlled hydroponics system for home use; and Swoppit, a website where people can swap items through single or multiple trades. Each of these three teams received $3,000 in seed money, and the judges also awarded seed money to three additional teams. A generous individual donor gave most of the money to fund these seed grants. "We will build on this model and expand it as we move forward," Shaanan said. "It will be a great way for alumni and businesses to directly impact entrepreneurship at UCSC." Japneet Kaur, a business management economics major who just finished her junior year at UCSC, leads the Aganki team. The Aganki product aims to securely integrate students' academic and social lives into one platform that promotes efficiency and transparency in their daily school activities. Kaur and team members Biney Kaur Dev and Sargunjot Kaur plan to include a variety of features in their cloud-based productivity suite for students and instructors, including a "smart" calendar, automated grade book, open discussion forums, private messaging, and student profiles. It's all designed to provide useful tools for both students and instructors and to improve their online interactions. "As students, we see the need for this in our daily lives," Japneet Kaur said. "Each professor uses a different online platform for their courses. It would be a big improvement to have all our classes on a common platform, and it could allow for more open collaboration between students and instructors." The Entrepreneurship Showcase was a great opportunity to network and make connections, she said. "We got a lot of really good advice from people, including one of the judges. The fact that they took us seriously enough to offer suggestions was pretty cool." This was the first academic year for the Entrepreneurship Studies Initiative established by Shaanan, who has developed courses and other activities in entrepreneurship for the initiative. The students participating in it come from a wide range of disciplines, including economics and engineering, he said. "We have a very good, solid crop of student projects this year, and I think we have a fantastic model. I'm already developing the outline for next year," Shaanan said. The Entrepreneurship Showcase event was sponsored by the Baskin Alumni Advisory Council, the UCSC Entrepreneurship and Business Group, the Technology and Information Management program, and the UC Santa Cruz Foundation.